Television Studio Production in St. Louis. a st louis video production studio. Anchorwoman Karmen Johnson on the set for the Abolition News Network. Ms. Johnson is the spokesperson for the educational narrowcasting series for the web and DVD syndication. The first series on slavery pays homage to the heros and heroines of abolition in the 19th century. The first clip of SlaveGirl reached over 200 hits on YouTube in one weekend, and double that the following week. Viewership continues to rise and a marketing plan has been prepared to distribute the DVD’s nationwide. 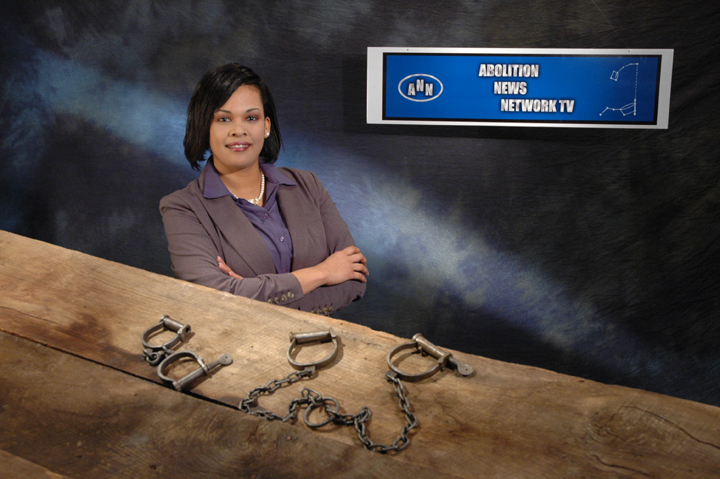 Anchorwoman Karmen Johnson on the set for the Abolition News Network. Ms. Johnson is the spokesperson for the educational narrowcasting series for the web and DVD syndication. The first series on slavery pays homage to the heros and heroines of abolition in the 19th century. The first clip of SlaveGirl reached over 200 hits on YouTube in one weekend, and double that the following week. Over 1,200 hits in the Spring, 2009. Viewership continues to rise and a marketing plan has been prepared to distribute the DVD’s nationwide.